1. SADM Convention: (Fall weekend, see below for more info.) – those in the Production from last year will be competiting and are required to attend classes. Others are welcome to join us to attend classes. 3. Competitions (Feb – May, exact dates announced as soon as possible)(Pre-Company not included as a class)- The Juniorettes will compete with 2 group dances in one competition. The Juniors will compete with 1 group dance in early spring and 2 group dances in mid-late spring. The Seniors will compete with 1 group dance in early spring and 3 group dances in mid-late spring. The Production dance will compete in early spring and mid-late spring. Any solos, duets, etc. may compete in the above mentioned competitions and also compete in a third and/or fourth competition that we go to as well as the Competition Premiere Showcase. 4. Ballet Rehearsals (includes Pre-Company) – after competitions are over (end of March-early April) we begin rehearsals for our story ballet. These usually take place during normal class times (in the jazz/tap class time, production class time, and eventually ballet tech class times) approx 3-4 times per week. We put together an entire ballet in a very short amount of time and attendance is very important. Absentees may not be included in some parts. Schedules are handed out approx. 1 month in advance. 5. Class Attendance – We are a high caliber studio. We compete with studios that have classes 4-5 times per week. We can stay at the same level due to the amount of material and technique we work on in a shorter amount of time. In order to maintain this quality we must have high attendance and promptness. You are expected to have an attendance rate greater than 80%. We will evaluate this rate each 6 weeks or so. If you have less than 80% attendance, we will send home a probation note. Anyone with two 6 week periods at less than 80% attendance may be removed from all or part of a dance. Three classes of observing only without participating will be counted as one absence. 6. Promptness – At this level of dance, it is physically dangerous to be late for class. Please make every effort to be on time, if not early. Those coming in late will be required to do the warm-up on their own before joining the class for their own safety. Three tardies will equal an absence when calculating attendance rate. 7. Performing Priveledges – Performing is a priviledge and not a right (regardless of any payments). It may be taken away if attendance, dedication, or attitude becomes a problem. 9. Recital – (a Saturday in late spring, includes Pre-Company) – Three stage rehearsals are mandatory and studio rehearsals are very close to mandatory in the few weeks prior to recital. Company classes and Pre-Company will perform in all shows of our recital. 10. Master Classes (Pre-Company not included) – All company members are expected to complete a minimum of 6 hours of master classes during the year (observing will not count, only participating). Master classes are convention classes taught by professionals. 1. 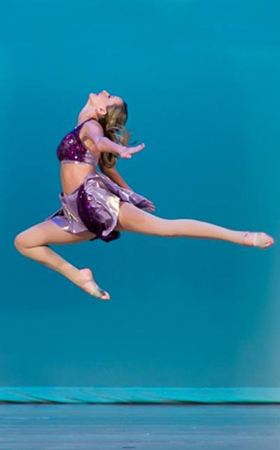 Southern Association of Dance Masters Convention: (includes Pre-Company as well as younger experienced dancers by teacher permission) Master classes taught by nationally known dancers, choreographers, and teachers. A competition is held in conjunction. (Last year’s production and company group dances may compete). The Production dance will have weekly rehearsals to prepare. Your costs would include optional hotel room (make reservations on your own with the SADM rate), SADM tuition, and any competition fees. 2. Private classes – As explained previously. Remember that these are extra activities. Your class commitment should come first and any additional solos, duets, etc. (especially if you have more than one) should come “in addition” NOT “instead of”. All additional lessons must be approved by parents. Parents, remember you have the last word on how many your child does. 4. Production dance – (Pre-Company not included) – Beginning in October, those that choose to participate will attend weekly rehearsals. The dance will be performed at the recital and two competitions. The cost will be a monthly fee and includes tuition, costumes, and competition fees. You will pay 7 monthly payments total. No additional shoes will be required. You will use what is required in your class. If you do not attend a rehearsal, you may not be in that part of the dance. 5. Studio Trips – (Pre-Company not included) – a cruise performance is tentatively planned for every 3rd summer. 6. Competition Groups – available to apply to join specialty groups that will compete over and above the company class competitions. See Competition Group Page for details. This is separate from regular company classes. 7. Warm-ups (Pre-company not included) – Company members ONLY may purchase Dance Academy of Bartlett warm-ups. These will be ordered (along with other DAB merchandise) in October. All Company competition group dancers should order these if you do not have them already. Others do not have to, but are encouraged to do so, so that we all will match at competitions and conventions. They make good cover-ups for costumes as well. 8. Extra ballet classes – (Pre-Company not included) – If you miss your own ballet class, you are expected to make it up. As you all know, ballet technique is the most important part of your dance education. In order to increase the ability of the lower levels, you are welcome to take them on pointe (assuming you are on pointe). Because these groups are much more than just classes, but companies, students are expected to act accordingly. A company works together as a team to help each other become the best dancers they can be and each person must do her effort for the group to achieve its goals. (whether the goals are doing well in a competition or just doing their best in class). * Behavior: I expect students to want to learn dance when they come to class. I will not tolerate behavior problems as they take away from the rest of the class. We, of course, will try to work out problems in the classroom, but if the problems persist I will contact parents. Problems between students occasionally arise. While I will try to work out the problem (remembering I am not the psychologist), students (especially Seniors) need to learn to leave their problems at the door and come to class to dance. We cannot waste dance time on this. Most of the time these are perfectly normal situations and can be quickly worked out. Students will be excused form class if they disrupt the class with behavior problems (this includes disrespecting the teachers). It will not be tolerated at this level. Gossip from students or parents will not be tolerated either. If there is a problem, you discuss it with the other person directly and not with others. If this rule is not followed, a suspension from the studio will be enacted. If additional problems persist, removal from the studio will occur. Note about “At Home” Discipline: Please do not punish your child (and her classmates and teacher) by taking dance away from them. If SuzyQ likes math but is doing poorly in English would you make her drop math as a punishment? Of course not. Dance is educational also. If you need to punish, please begin with other less worthy endeavors (stereo, phone, car, social activities, etc). If SuzyQ is unable to do the work because of dance (not just being lazy, procrastinating, poor time management) then that is a different story. Most of the time, grounding from other things will work just fine. If you do choose to pull her out of classes, I must also follow our rules and not allow participation in performances, etc. if rehearsals/classes are not attended. Please remember that tuition must be paid regardless of absences.